Prokil, Damp & Timber Specialists are a privately owned damp-proofing and timber treatment company based in Bournemouth. Prokil are the number one choice on the market for all damp and timber treatments and customers benefit from over 50 years experience and industry knowledge. With a dedicated team whose aim over the past 50 years has been to provide a fast and effective remedial service whilst delivering outstanding customer service. Our expert surveyors identify problems within a wide range of properties whilst experienced operatives implement solutions and remedial work. Prokil has attended thousands of domestic and commercial properties throughout the south of England, successfully controlling, curing and treating damp, rising damp, woodworm, dry rot, wet rot and all other forms of dampness, condensation and timber decay found in buildings. Our experience and training enable us to diagnose the causes of penetrating damp, rising damp, woodworm or fungal decay problems and to recommend and implement the correct remedial measures of controlling or treating them. We are Property Care Association (PCA) registered so customers can rest in the knowledge that their property is in the best hands. All our expert surveyors are fully trained and qualified as a Certificated Surveyor in Remedial Treatment (CSRT). 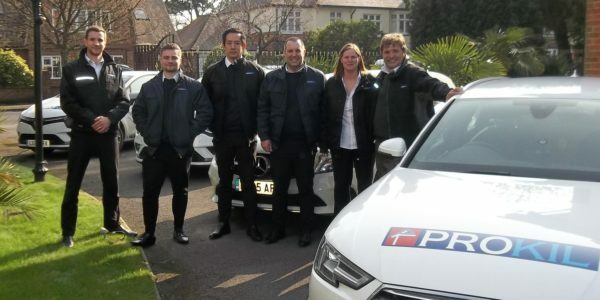 Prokil was founded by Jim Thorne in 1965 in Bournemouth and has provided the residents of Bournemouth and surrounding areas with damp and timber treatments alongside excellent customer services. In August 2010, Jim decided it was time to retire and passed on his knowledge and experience to Carlo Marsango, current owner of Prokil. 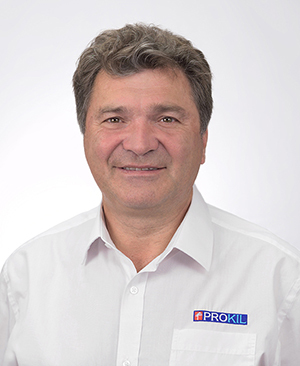 Carlo has extensive experience in the building and property maintenance industry and has developed the Prokil brand over the last 8 years. Carlo has a strong vision for the brand and sees potential in creating a Prokil network across the UK via Franchising opportunities. Providing the UK with the best knowledge and expertise in handling damp and timber issues within residential and commercial properties, whilst always maintaining the highest customer service. Prokil offers a variety of products and services to help meet the needs of their customers, specialising in the treatment of damp and timber preservation. Chemical damp proof course injecting, cavity clearing, re-plastering, fixing cavity drain membrane and installing subfloor ventilation. Timber replacement, timber treatment with pesticides and treatment with preservatives. The resultant works include replacing wall ties and remedial brickwork. The remedying processes includes the installation of ventilation systems and spraying of chemical biocides. All surveys are carried out by fully qualified CSRT surveyors. Following the initial survey Prokil will provide the customer with a full written report within 2 business working days advising the customer of the results of the survey and suggested remedial works. Get in touch with our dedicated Franchise Manager or request our Prokil Franchise Brochure to start your journey to becoming a part of the Prokil Franchise Network.